SHANGHAI (Reuters) - China's average concentrations of lung-damaging small particles known as PM2.5 rose by 5.2 percent in the first two months of the year, the country's environment ministry said on Thursday, casting doubt over its ability to meet winter targets. 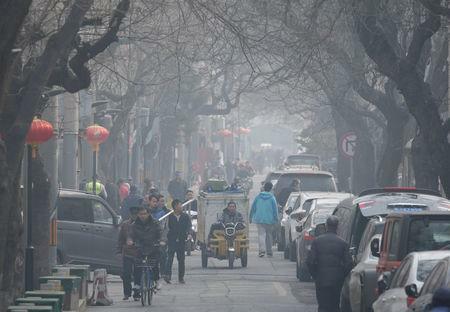 The nation's average PM2.5 readings came in at 61 micrograms per cubic metre for January and February, according to a Ministry of Ecology and Environment survey of 337 cities, with only 83 registering the national standard of 35 micrograms. The government has previously blamed unfavourable weather conditions for the poor air quality over the period, saying that "a weak El Nino effect" and a subsequent increase in temperature and humidity has made it harder to disperse emissions.